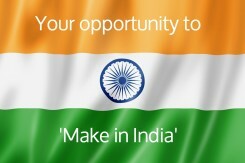 Make in India is an initiative launched by the Government of India to encourage national, as well as multi-national companies to manufacture their products in India. It was launched by Prime Minister Narendra Modi on 25 September 2014. India emerged, after initiation of the program in 2015, as the top destination globally for foreign direct investment (FDI), surpassing the USA and China. Today, major assemblies for Airbus and Boeing platforms are produced in India and aerospace companies like UTC Aerospace Systems, Honeywell, GE Aviation, Safran and Moog build product there. It’s also become a magnet for defense industry invesment. Motivated by this initiative, our partner, Miracle Electronics, based in Bangalore, has broadened its reach and scope. The company has evolved from being a quality producer of wound magnetic products to one offering cable harness and box building capabilities across market sectors, including defense, aerospace and medical. Ex-Eltronics brings this capability to its clients, opening up the opportunity to Make in India, but in a managed and controlled fashion and with a delivered price. Ex-Eltronics provides technical assistance in the design and development of bespoke cable harnesses systems and offers cost efficient manufacture through Miracle Electronics. Miracle Electronics has an established infrastructure within Bangalore to support client requirements for part or full box integration. Toroidal, EI, Power, Audio, SMPS and UI encapsulated Transformers, Chokes and Inductors are available through our association with Miracle Electronics in India.